Today marks the official 1 year anniversary of Erin Berry, Photographer. I wanted to do this huge long sappy post about how grateful I am to everyone that has helped in out in this first year of managing my own business. What makes me laugh, is business has kept me so busy in the last few months, I haven't had time to even sit down and think about how far I've come in the last year. I will admit that opening an actual real live business scared the crap out of me. Applying for business licenses, and EIN, filing taxes.... it's incredibly intimidating. 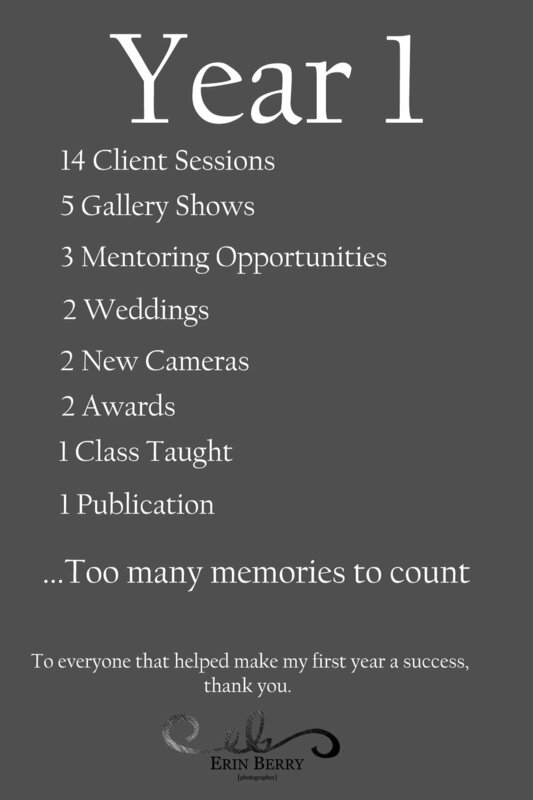 Then add in marketing, sales, pricing, book keeping, learning.... yeah, running a photography business is really only like 10 percent taking photos. I've all but turned into a workaholic. I live and die by my phone. My family has sacrificed so much to allow me to start a business with a solid leg to stand on. From putting up with answering client emails before bed, editing photos late into the night, time away from home to focus and learn... I am so thankful I have these people behind me to help me. My clients have been nothing short of amazing. Putting up with my crazy ideas, getting my name out there to others, and leaving some amazing feedback for other people to read. I can't thank you all enough for the support, love and generosity. Finally, to my community of photographers. The people I can email, message, annoy on a daily basis with my questions and concerns. People that have given me tremendous feedback and resources to help me learn and grow and succeed. Thank you all. Year 2 is going to be all this and more. I am demanding amazing things. I look forward to capturing more of the everyday, more love stories and more stories for us all to feel connected. So, cheers to year 1. It's been nothing short of a dream come true. And with that being said, to celebrate an entire year of hard work, I am taking a week away to reconnect with my family so I can run head first into year 2 with some amazing energy.